Charles Mulwana, a farmer from Uganda, is staying with us at our Riverford Farm in Devon for the next two months. In 2005, aided by charity Send a Cow, Charles received his first cow, Helen. Send a Cow helped him learn about sustainable organic agriculture, looking after livestock and how to grow a variety of crops to feed himself and his family. Charles has come to the farm at Riverford to learn how we grow organic crops on a larger scale. 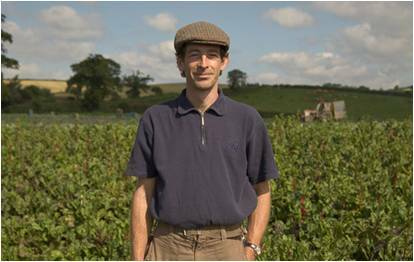 He is passionate about passing on the knowledge he has gained, particularly on the importance of organic farming and having a balanced diet. 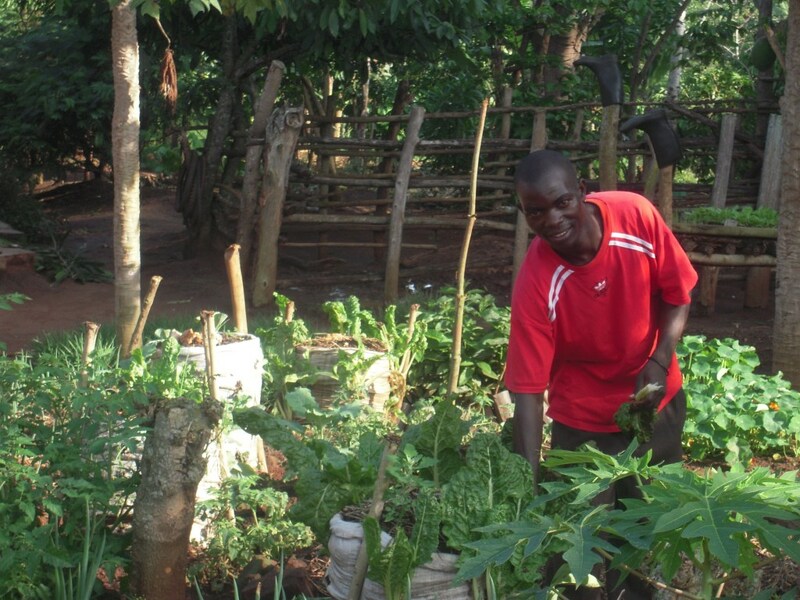 To do this Charles is hoping to raise enough money to build a community centre in his village in the Nakifuma Mukono district of Uganda, to educate young people in his area on agriculture and running a business. 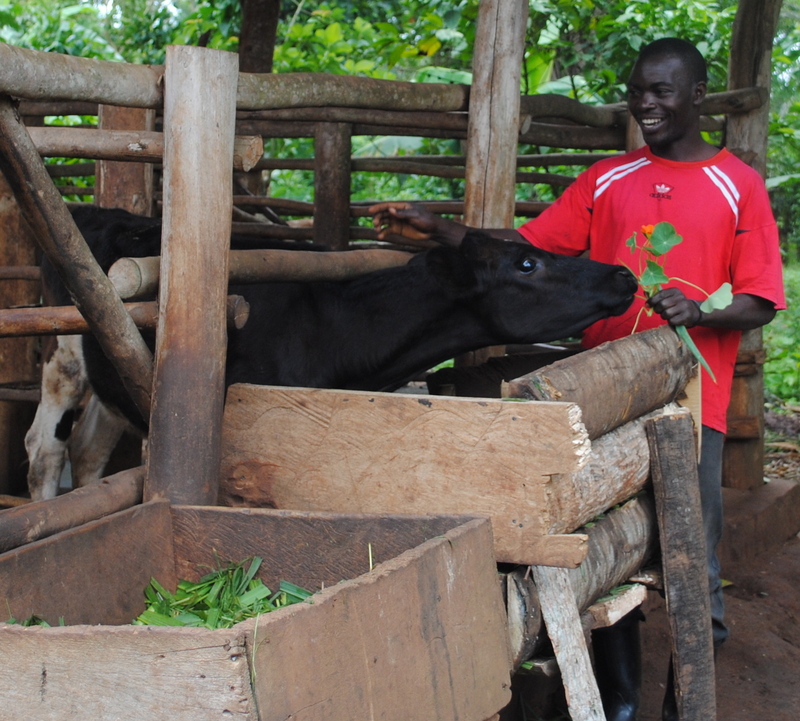 He has become a Peer farmer trainer for Send A Cow, helping to train other farmers, and has passed on a gift of a calf to other farmers in his community from his first cow. This is Charles’ second visit to Riverford. During this stay he will be spending time with our picking and farm management team learning how we plan and produce our seasonal veg. So far our farm team have kept him busy learning a variety of larger-scale farming techniques. 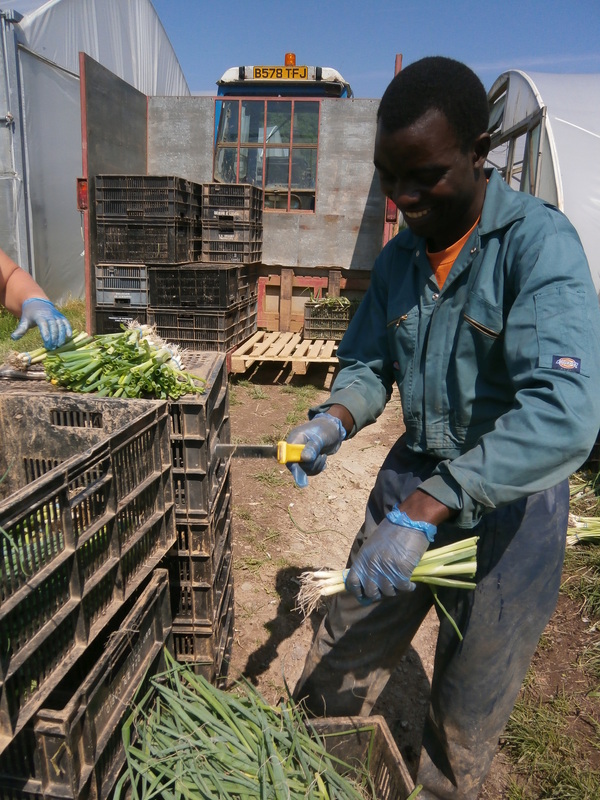 It’s also been very hands on and Charles has been helping us with our everyday farm work – from picking and bunching spring onions to go in our Riverford boxes, to harvesting our lettuces and spinach. A useful agricultural tip he said has learned while working in the fields here is how we harvest our spinach. When harvesting spinach in Uganda they traditionally leave part of the plant remaining, in order for it to grow back. Here Charles has found that if you cut off all the leaves, the plant will grow back quicker (within 2-3 weeks). 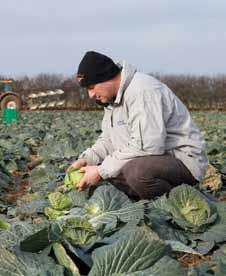 Charles is also interested in the different varieties of fruit and veg that he doesn’t currently grow at home. In particular, he is hoping to grow more varieties of tomato on his return to Uganda, including beef and cherry tomatoes, which he feels will be popular. He’s also keen to grow cherries and green peppers. At home in Uganda, Charles grows a range of crops to feed his family, with a little extra to sell. 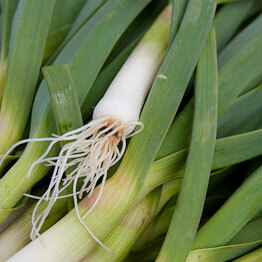 These include onions, spinach, kale and sweetcorn which are prepared daily by his wife Barbara for their four children. Sadly his first cow passed away, however his new calf (also called Helen) produces approximately 12 litres of milk each day and he grows bananas and coffee which he sells. It’s been great to welcome Charles to the farm to spend time with the team at Riverford. If you have any questions for Charles on farming in Uganda and the UK, please send us a message at help@www.riverford.co.uk/blog and we’ll be happy to answer your questions. 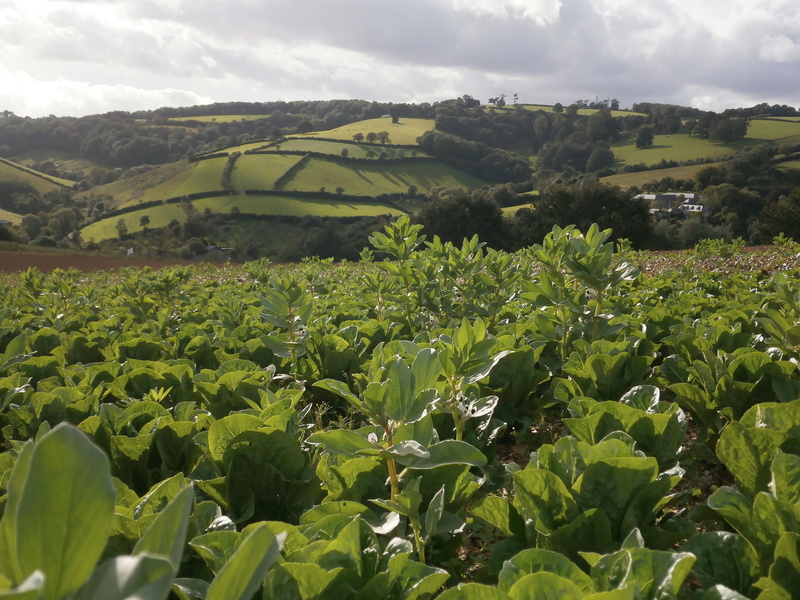 Our early season crops are usually planted in fields across the valley from us, as they are broadly southfacing and warm up quicker with well-drained soil to allow early planting. As these can’t be irrigated we rely on the usual April showers to water them for us. Last year the long dry spell actually meant that some of the lettuce got stressed, bolted, and we lost a fair amount of the crop. Not this year! Below average temperatures mean that the crops are growing more slowly than hoped, but there is certainly no lack of water. Continual rainfall such as we are experiencing at present brings its own set of problems, however. At this time of year we would be frantically planting, fleeceing, brushweeding and hoeing our lettuce, spinach, summer greens and so on; but not now. 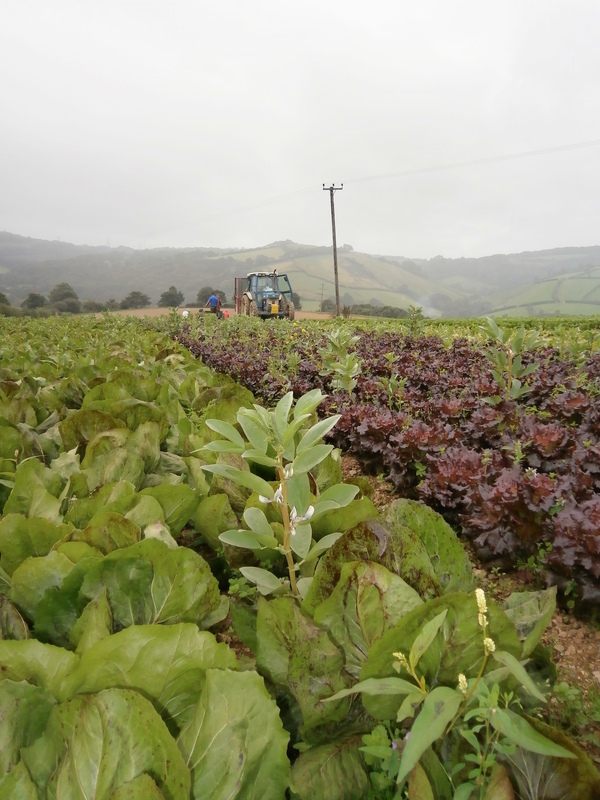 The fields are simply too wet to cultivate and a short break in the weather is little help as they need a minimum of 2-3 days (sometimes more depending on the soil) to dry out enough to work. Fortunately for our staff there has been plenty to do in the polytunnels: Manuring, putting up supports for tomatoes, and plenty of hand planting. But as this begins to draw to a close we can forsee a few quiet weeks ahead whilst we wait for the crops we have to come on and pray for a break in the weather. On the up side our wet garlic is looking good; this was planted as individual cloves that we broke up from whole bulbs in late October and early November. The two varieties we grow are Germidor and Messidrome as they produce large cloves: and usually the larger the clove you plant, the larger the wet garlic you produce. Meet Paul Babcock. 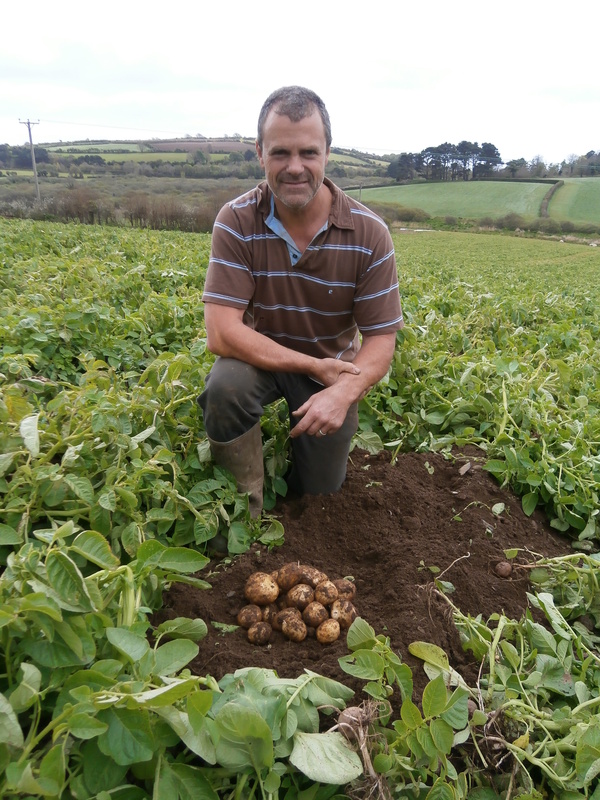 Paul grows our organic new potatoes on his farm in Cornwall, just one mile from the sea, within view of St Michael’s Mount. 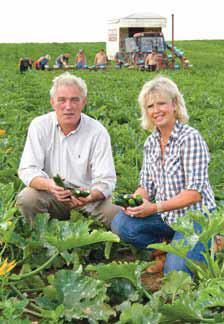 Paul’s family have been there since 1958 and he has been growing organically for seven years. He also owns a pub locally, where he sells his vegetables and meat. 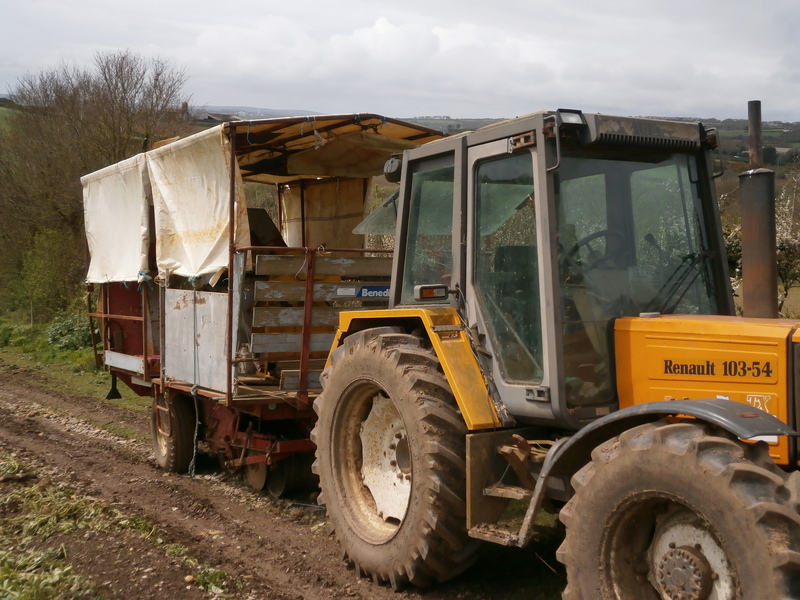 This is Paul’s tractor, which he uses to harvest his organic new potatoes. 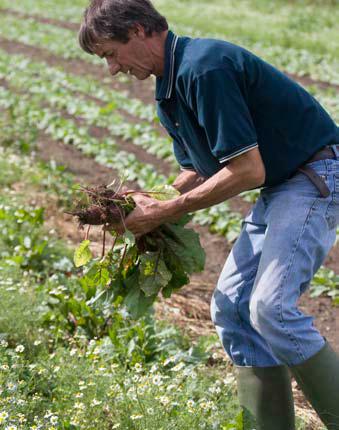 The high light levels and mild temperatures make Paul’s land ideal for growing new potatoes. The farm is above slate, which means it is free draining and has warmer soil. 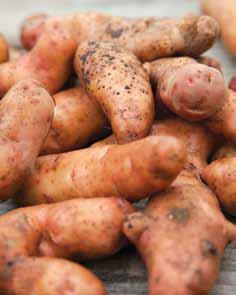 This rainy season has been particularly good for the potatoes, which you can order from Riverford. Three years ago we decided to phase out our use of tomatoes, peppers and cucumbers from heated glasshouses, however local. Maintaining 20˚C in single-glazed glasshouses in frosty January is completely insane, making these easily the most environmentally damaging crops we sold. After a year of haggling with local planners, we’re now building sophisticated plastic-skinned greenhouses, which will grow tomatoes and cucumbers in the summer and salad leaves in the winter without heat. When they are in production we will have the best tasting, lowest impact salads money can buy. 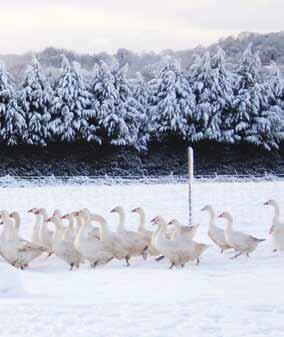 Nigel and his team have been hit by a bit of a mystery – almost six acres of our swedes have vanished. In mid-July the young plants were looking good, but soon almost the whole lot had gone, over 400,000 plants. We now think the culprit is ‘cutworm’ – caterpillars of the turnip moth and garden dart moth. They feast upon roots and stems, felling tender seedlings at the base, which then shrivel and leave nothing but bare soil. Fortunately, to balance things out, we’ve had a really successful broad bean season and our 8 acres of leeks and 30 acres of red and brown onions are looking very strong. Peter’s summer has gone well, with parsnips, leeks and Savoy cabbages looking very healthy for the boxes later in the year. Squash and pumpkins are also coming along nicely, just in time for Pumpkin Day. 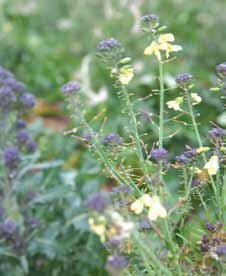 This year, Peter has avoided planting cauliflower or purple sprouting broccoli however. The last two harsh winters have lost him these crops, so he’s had to make a pragmatic decision. Fingers crossed for next time. Recently Chris and his team have been harvesting yellow ramiro peppers, also known as banana peppers, from the polytunnels. They don’t taste of banana, but if you have any fussy kids, they may help you in convincing them to try something new! Meanwhile, for the first time we have Hampshire dried garlic from our grower Mike Fisher. Normally our climate makes drying garlic problematic, but Mike is particularly pleased with the results, and we’d love to have any feedback. The year started well with good crops of lettuce, spinach, fennel, chard and French beans filling the boxes through our ‘hungry gap’ at home, plus early sweetcorn and green peppers. However the normally sunny July delivered 80mm rain and with the high humidity, mildew swept through the melons. The heavily laden pepper plants look fantastic, but as the fruits start to turn red they are also developing rots. It is not all bad though; we have a small field of chillies which are coming along wonderfully, ready to add fire to all sorts of dishes. There is plenty to keep our field workers occupied over summer, with broad beans, carrots, basil, gooseberries, a few artichokes and cucumbers coming through and plenty more crops to follow. 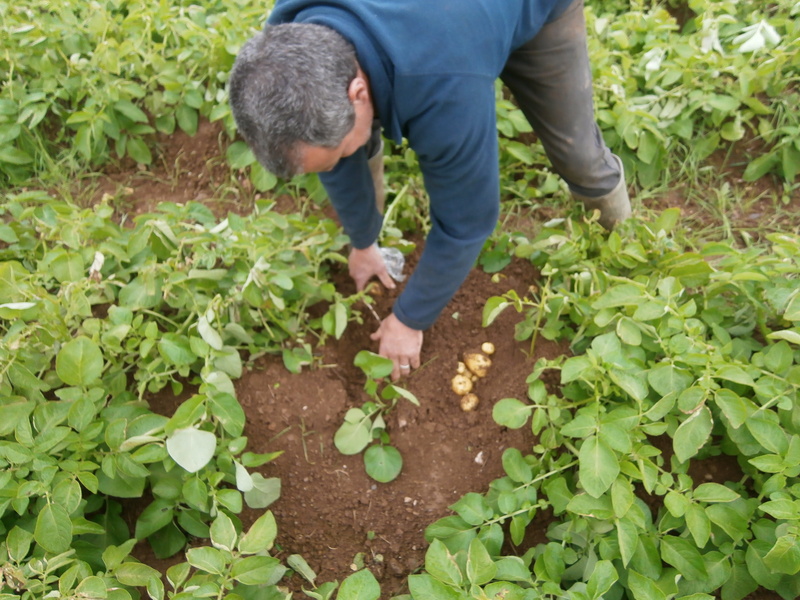 The Devon-grown new potatoes started with the Ostara variety, then Lady Crystal and the wonderful Charlotte. 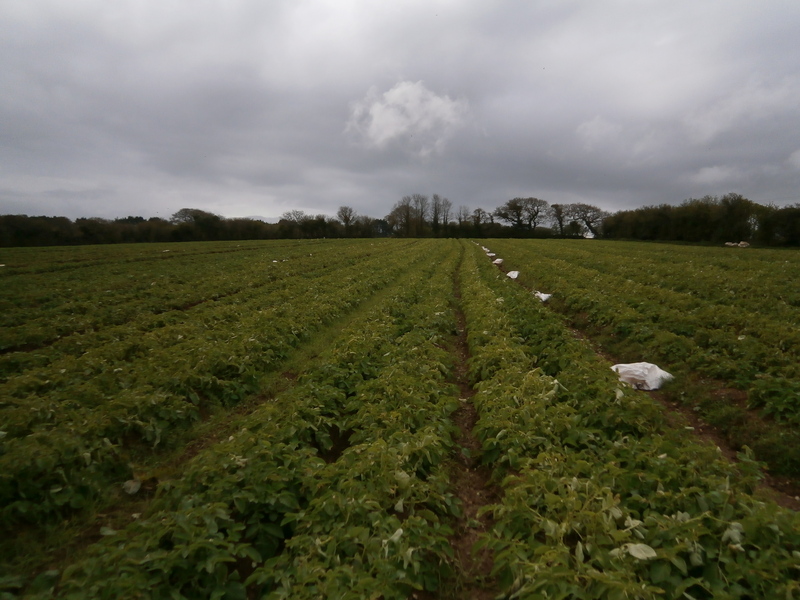 The dry weather is taking its toll though; where we have irrigation, the main crop potatoes are healthy, but beyond the reach of the pipes there’s a danger the tubers will never get to harvestable size. Nigel’s summer crops started well, although there were a disappointing number of strawberries due to the winter frosts. Gooseberries, however, are plentiful and the new season bunched carrots have been excellent. 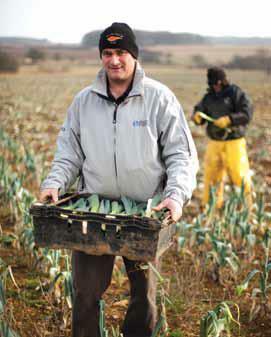 Planting also goes on at a pace: the first 30,000 leeks out of 300,000 recently went in, along with (in Nigel’s words), “cabbages for Christmas”. He had to be the first to mention Christmas – in summer. 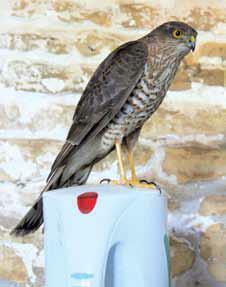 It’s been an exciting time for wildlife too, with one of our pickers finding a sparrowhawk perching on the kettle in the farm shed! Pet er’s kohl rabi and summer cabbages took a beating in the recent winds, with the soil sandblasting a couple of sowings into obliteration. Every cloud has a silver lining though and the soil-laden winds destroyed about 80% of the weeds in the adjacent field of courgettes. Elsewhere, planting and weeding continue as normal, with broad beans, calabrese broccoli, spinach and chard well on their way. Our tomato grower has reported a particularly well-established crop this year, so look out for them in the boxes. Meanwhile, Chris and his team have planted the last of the chillies, so all the polytunnels are now full, growing parsley, chillies and basil. We’re planning a chilli event on Friday 19th August, where you’ll be able to harvest your own hot little numbers, feast on an organic picnic and watch our Riverford Cooks demonstrate some fiery dishes. Check our website for details. This is the second year of crops coming from our farm in the French Vendée, to help us bridge the ‘hungry gap’ and keep your vegboxes full and interesting when very few crops are ready in the UK. While last year was a bit of a disaster thanks to inclement weather, inexperience and some bad luck, 2011 has started well. We brought in the best fennel harvest we’ve ever seen, along with excellent courgettes and bunched carrots. This year we also plan to trial an early, autumn-sown crop of carrots, with the aim of bridging the gap between our stored and bunched carrots next spring. It’s a bit of a risky strategy but we’re keen to avoid having to import them from further afield.